We descended on Turks & Caicos last week to celebrate the 50th birthday of a great friend. There were 25 or so in the group, arriving in clumps as summer schedules allowed, couples and singles and kids in tow for the family few. The Caribbean is wilting in July and between the pool and beach we were growing gills by the end of the week. Constant hydration was le rigueur, with a steady water infusion plus rotating lineup of cold Presidente beer, rosé wine and local rum punch as the sun dipped from noon to night. Turks & Caicos has the third largest coral reef in the world. Its beaches have been voted the most beautiful, it’s diving the most stunning on this planet by Tripadvisor and others. The water is warm and calm and visibility exceeds 100 feet, sometimes more. Needless to say the boating and snorkelling is unforgettable. The variety of sea life darting over and through the vibrant coral is a visual feast, from spinning swarms of tiny forage fish to solitary predators gliding majestically over the sandy floor. Blue tangs and bar jack, eagle rays and lemon sharks and barracuda, parrotfish and trumpet fish and damselfish, … and conch. Oh the conch! 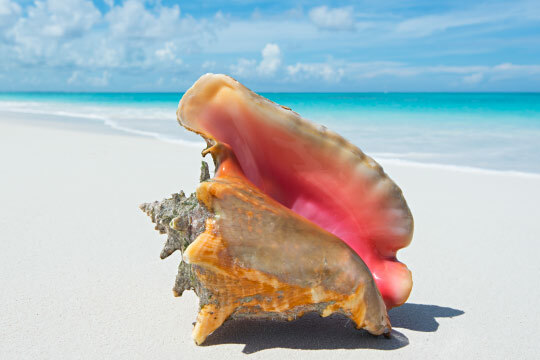 This large spiral sea snail is the sought-after celebrity of Turks & Caicos and served in most every eatery, as raw ceviche, over tender leaves of salad, deep fried into fritters, however you enjoy it. It’s the royal plate for the well-heeled to the flip-flopped. It’s colorful, delicious, and makes for one hell of a sea horn. Yes, by week’s end we grew gills and had conch coming out of our ears. The birthday party group at Turks was as diverse as the fish in the crystalline blue sea. We were old and young, gay and straight, black and white and beige and olive, carnivores and herbivores and pescetarians, liberal and conservative, wealthy and not nearly so, some overworked and a few unemployed, flying in from all points on the globe. Among us were doctors and consultants and professionals of every stripe, restaurateurs and a bartender, jewelry shop owners and a jewelry designer, musicians and writers (who isn’t these days? ), a physical therapist and a garbage man, students and grandmothers. Who am I missing? I’m convinced that this variety was key to the unending smiles, hugs, and the warm and familial vibe of the amazing week. We open ourselves to the diversity of colors around us and our worlds become richer and vastly more fascinating. Among our immediate and extended networks, and networks beyond that, we have the diversity of the boundless sea. Why limit our reach to fish of our own color and stripe? The merits of openness extend beyond simply more interesting rum cocktail conversation. Many of us have grand ambitions that profit from a wide spectrum of connections, experiences and advice from all walks of life and corners of the sea. Limit your network and you limit your possibilities. Teach, learn, grow, … now where’s that rum punch? Bill, you eloquently captured the spirit of our collective group and our magical week. Thank you, I will read this often to remember the amazing community we created.